Reading and share top 18 famous quotes and sayings about Townsend by famous authors and people. Browse top 18 famous quotes and sayings about Townsend by most favorite authors. 1. "You get some sleep, Abigail," Townsend told her. "I'll keep watch. ""That's very gracious of you, but being that we're on an airplane..."Even after the plane took off, they kept debating security perimeters and protocols. I'm pretty sure they argued for forty-five minutes about where the best place for cappuccino was near the Colosseum." 2. "Don't mind me," I said. "I'm just the person who tried to rob the place last July. ""No, you diddn't," Abby said, appearing on the roof. She was wearing a trim suit and tall black boots. Her hair was pulled into a sleek ponytail at the nape of her neck, and either i was imagining things or Townsend wasn't quite as good a spy as I thought, because I could have sworn I saw him drool a little.Note to self: your aunt is a hottie." 3. "Excuse me, Abigail, but whose shift did she get away during?' Townsend asked with a glare. 'Excuse me, Townsend, but who was supposed to booby-trap the doors? ''I'm an agent of Her Majesty's Secret Service,' Townsend said, indignant. 'I do not do booby traps." 4. "Townsend shrugged. 'With all due respect to the good doctor, I highly suspect he's a moron,"
5. "If you ever put a student at this school in danger again-''Oh, I thought you Gallagher Girls were immune to danger. 'Despite the hundred girls the filled the foyer, no one moved or gasped or tried to defend our honor. We stood silently, waiting for our headmistress to say, 'Oh, we are quite used to being underestimated, Agent Townsend. In fact, we welcome it." 6. "Abby must have been the one who found the safe house, because Townsend didn't like it. "The building across the street is under construction," he snarled as soon as we'd carried our bags inside. "The elevator has key card access, and I've hacked into the surveillance cameras from every system on the block," Abby argued. "We have a three-hundred-sixty-degree visual.""Excellent." Townsend dropped his bag. "Now the circle can see us from every angle. ""Don't mind Agent Townsend, girls," Abby told us. "He's a glass-half-empty kind of spy. ""Also known as the good kind," he countered. Abby huffed." 7. "After finals and winter break...after I'm back to full strength, we'll go get Preston. Whether Mom and Abby and Joe and Townsend like it or not, we'll go get him. And then...' I trailed off. 'And then we'll finish this. Next semester, this thing ends." 8. "Time, Ms. McHenry," Townsend said. "It can be a cruel, cruel thing"
9. "So you're Zach." Townsend didn't even try to hide the judgement in his voice as he looked Zach up and down in some sort of silent but dangerous examination.Zach huffed but smiled. "so you're Townsend. "The two of them stared for a long time, wordless. It felt like I was watching a documentary on the Nature Channel, something about alpha males in the wild." 10. "Daltrey was by all accounts the toughest man in the Who; maybe the toughest man in London. Filled with blue collar attitude, he strutted around the stage, screaming out the rage of a century of London's dead end lives, roaring like a young lion trapped in a decadent, dying England. Townsend wrote prettily, daydreaming foolishly individualistic dreams of artistic expression, but it was Roger's sledghammer voice that smashed the skulls of the enemy." 11. "Mary O'Donnell had been nursing that baby, and the day after Agnes was committed to the sea, her milk stopped flowing. She thought it only a natural result of grieving for Agnes. She would go on to have three more children with her second husband, the seller of Augustus Townsend's walking sticks, but with each child the milk did not return. "Where is my milk?" Mary asked God with each of the three children. "Where is my milk?" God did not give her an answer and he gave her not one drop of milk. With the second and third children, she asked Mary the mother of Jesus to intercede with God on her behalf. "Didn't he give you milk for your child?" she asked Mary. "Wasn't there milk aplenty for Jesus?" 12. "I swore I'd never become some lord's brainless arm ornament and political host, but I've become far worse. I'm a glorified housekeeper and sperm donor. -from the journal of Payton Marcus Townsend." 13. "F. Franklin the Fourth has a job with a firm rich in heritage, money and pretentiousness, a firm vastly superior to Brodnax and Speer. His sidekicks at the moment are W. Harper Whittenson, an arrogant little snot who will, thankfully, leave Memphis and practice with a mega-firm in Dallas; J. Townsend Gross, who has accepted a position with another huge firm; and James Straybeck, a sometimes friendly sort who's suffered three years of law school without an initial to place before his name or numerals to stick after it. With such a short name, his future as a big-firm lawyer is in jeopardy. I doubt if he'll make it." 14. 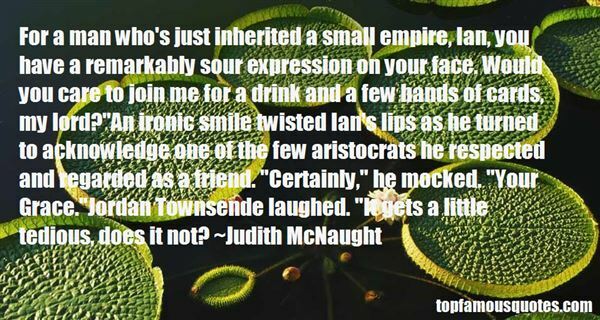 "For a man who's just inherited a small empire, Ian, you have a remarkably sour expression on your face. Would you care to join me for a drink and a few hands of cards, my lord? "An ironic smile twisted Ian's lips as he turned to acknowledge one of the few aristocrats he respected and regarded as a friend. "Certainly," he mocked. "Your Grace. "Jordan Townsende laughed. "It gets a little tedious, does it not?" 15. "Eden, I had planned to use that information to hold you grandfather overfire. I intended to force him to return what Townsend stole through manipulating my mother. I wouldn't want you to think otherwise. I went to a lot of trouble to get that story over a two year period of my life. "She knew it had cost him. It was still costing him because he had allowed his work to slip through his fingers.And you surrendered it," she said. "Why? You could have won. Grandfather would have given you what you watned to keep you from publishing the story. He would have made Townsend cooperate. "Rafe looked off in the distance...If I had, Eden, I would have lost more than Hanalei. I weighed everything in a balance and decided there was something I wanted even more." 16. "Although she seems sweet and innocent and shy, at times she seems ready to participate in a much more intimate and dangerous game. I know I shouldn't be thinking about games or misery or anything else concerning Olivia Townsend.But damn if I'm not!" 17. 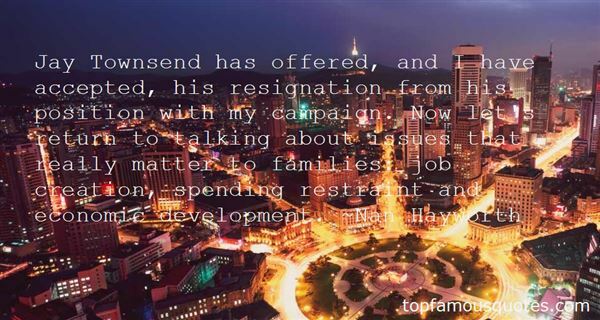 "Jay Townsend has offered, and I have accepted, his resignation from his position with my campaign. Now let's return to talking about issues that really matter to families: job creation, spending restraint and economic development." 18. "I've been very influenced by folklore, fairy tales, and folk ballads, so I love all the classic works based on these things -- like George Macdonald's 19th century fairy stories, the fairy poetry of W.B. Yeats, and Sylvia Townsend Warner's splendid book The Kingdoms of Elfin. (I think that particular book of hers wasn't published until the 1970s, not long before her death, but she was an English writer popular in the middle decades of the 20th century. )I'm also a big Pre-Raphaelite fan, so I love William Morris' early fantasy novels.Oh, and "Lud-in-the-Mist" by Hope Mirrlees (Neil Gaiman is a big fan of that one too), and I could go on and on but I won't!" I don't expect people to agree with all my votes."